Ministry of Railways have announced that that the new Zonal Railway Train Time Table 2018 – 2019 and Trains at a Glance 2018 – 2019 will come into effect from 15.08.2018 instead of 01.07.2018. The Ministry of Railways will be releasing its new All India Railway Time Table known as “TRAINS AT A GLANCE (TAG)” effective from 15th August, 2018. In addition to the “Trains at a Glance”, all the 17 Zonal Railways will also be releasing their respective Zonal Railway Time Tables (5 Zonal time tables in all, each Zonal Time Table comprising 3-4 Zonal Railways) which will also come into effect from 15th August, 2018. The New Trains at a Glance will also be available w.e.f. 15th August, 2018 on Indian Railways’ official website. Accordingly 24 new trains, 66 extension of trains and 4 increase in frequency of trains which have already been started using the lie over rakes have been incorporated in the new Time Table w.e.f. 15.08.2018. In the current year, 50 conventional services have already been replaced by MEMU/DEMU upto 15.08.2018 and 50 more conventional services are planned to be replaced by 31.03.2019. Zonal Railways have incorporated traffic corridor blocks of 2.5 to 3 hours duration in the new Working Time Table w.e.f. 15.08.2018. In the WTT 2018, the duration of corridor blocks is about 292 hours more than the corridor blocks available in WTT 2017. Mega blocks on more than 95% sections in all the Divisions of Indian Railways have been incorporated in the new time table. In case mega block is availed, Zonal Railways may allow 2 hours corridor block on 3 alternate days in the week. The charting of trains having MPS of 110 Kmph has been carried out at 105 Kmph to the extent possible to reflect actual running. This will further help in improving the punctuality of the trains. The Rajdhani, Shatabdi, Tejas, Gatimaan, Humsafar, Garibrath, Duronto and Antyodaya Express trains having MPS of 130 Kmph have however been charted at 130 kmph. A careful analysis of the reasons for loss of punctuality has been carried out for trains regularly running late and necessary changes in the time table have been incorporated to improve punctuality. To provide more safe and comfortable journey the conventional rakes are being replaced by LHB rakes. In the year 2017-18, 49 number of conventional rakes have been replaced by LHB rakes. In the current financial year, 48 rakes have already been replaced by LHB rakes upto 15.08.2018 and 66 more rakes are planned to be replaced by 31.03.2019. In the current financial year, terminals of 23 number of trains have been shifted. 12 trains in NR, 5 trains in NCR, 1 trains in ECR, 1 train in NWR and 4 trains in SCR have been shifted. To streamline the operations by avoiding reversal, 20 trains have been shifted to adjacent terminals. In the current financial year, the terminals of 4 trains in SECR, 7 trains in WCR, 2 trains in ECoR, 5 trains in SER and 2 trains in NCR have been shifted. Central Railway announced that Zonal Railway Timetable and Trains At A Glance Will be In Force From 14.8.2018. Accordingly the existing Time Tables November 2017 issue viz. Western Zone Time Table (English and Hindi), Central Railway’s Marathi Time Table will remain valid till 14.08.2018. Following are the zone wise details of CR train time table. Following are the details of trains starting from Mumbai. Railway frequently changing Stoppages/ Augmentations/timing of Trains, following are the detail regarding that. Eastern Railway announced new train time table 2018, major changes are following. Non – Suburban : One passenger trains trip extended. Details of major changes in timings of important Mail/Express Trains and Passenger Trains, Regulation of Trains , Major Changes in timings of EMU Services are following. Details are following. The train timings for 84 trains have been adjusted at different Stations in the New Time Table for smooth running of trains. After conversion of trains from Passenger to MEMU, some trains have been re-numbered and included in Time Table. Extension of 12507/12508 Guwahati-Trivandrum-Guwahati Express to Silchar, 12503/12504 Kamakhya-Bangalore Cant-Kamakhya Express to Agartala, 15630/15629 Guwahati-Chennai Egmore and 15930/15929 Dibrugarh-Chennai-Dibrugarh Express to Tambaram included in the new Time Table. Train No. 12503/12504 Kamakhya-Bangalore Cantt-Kamakhya bi-weekly express extended to Agarthala. 18447 Bhubaneswar-Jagdalpur Hirakhand Express will arrive Koraput at 9:50 hours and departure at 10:10 hrs instead of arrival 9:20hrs and departure at 9:45 hours which will reach Jagdalpur at 13.4o hrs instead of 13.15hrs. 58502 Kirandul – Visakhapatnam passenger will leave Kirandul at 6:00 hours instead of 6:15 hours. 18518 Visakhapatnam-Korba Link Express will leave Visakhapatnam at 2o:o5hrs instead of 19.55hrs. 67294 Visakhapatnam-Srikakulam Road MEMU will leave Visakhapatnam at 08.00hrs instead of 08.05hrs. ECoR New Time Table to be implemented from 15th August,2018 – Changes in timings of trains, Extension of Trains, Increase in frequency, Re-numbering and introduction of New Train Services have been included in New Time Table, August-2018. NR Railway zones and train time table are following. Timings of more than 300 Northern Railway trains is set to change courtesy the new timetable. The Indian Railways new schedule will come into effect from August 15. 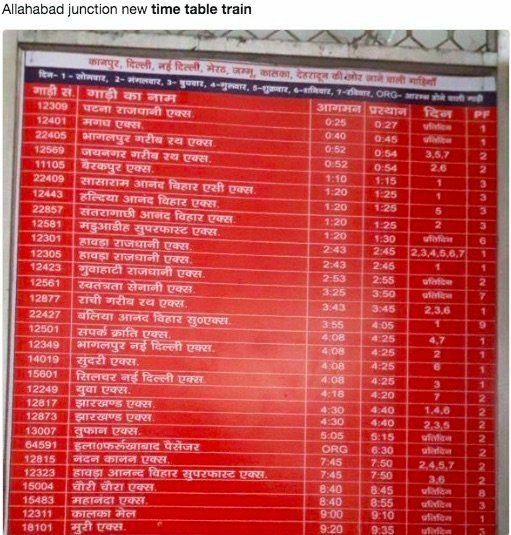 There are a lot of changes in the time table of Northern Railway. Some 57 trains’ timings have been brought forward while 58 trains will depart later than the timings at present according to the new Indian Railways timetable. Timings for train arrivals also will change in the new schedule. Some 102 incoming trains have been brought forward while 84 trains timings have been pushed forward. North Central Railway train time table and Railway zone details are following. East Central Railway and North Central Railway announced that some of the trains timings are revised from 12.03.2018. Following are the details. Indian Railways will take a new schedule from August 15, 2018 In this new time-schedule of some mail / express and ride vehicles on various stations of the northeast, the annual amendment has been amended. In addition to this, in the past years, there has been adjustments in the frequency of new mail / express and Democrat vehicles and in the frequency of a pair car. – 12531 Gorakhpur-Lucknow Jong. Intercity Express will departure from gorakhpur at 05.30 pm. – 55025 Gorakhpur-gonda ride car will departure from gorakhpur to 06.00 pm. – 15114 chhapra – lucknow jong. Express will departure from gorakhpur at 01.55 pm. – 12571 Gorakhpur-Anand Vihar Terminus, via humsafar express will departure from gorakhpur at 18.45 pm. – 75012 Gorakhpur-siwan demu car will departure from gorakhpur at 05.45 pm. – 55029 Narakaṭiyāgan̄ja-Gorakhpur ride car will reach gorakhpur at 00.15 pm. – 12583 Lucknow Jong.. Anand Vihar Terminus. Double Decker Express Lucknow Jong 0 to 04.55 pm. – 12536 Raipur-Lucknow Jong. Poor chariot lucknow jong. Will reach at 05.10 pm. – 12180 Agra Fort-Lucknow Jong. Express Lucknow Jong. Will reach at 11.40 pm. – 19716 Lucknow Jong 0-Jaipur Express Lucknow Jong. He’ll departure at 12.15 pm. – 12532 Lucknow Jong.- Gorakhpur Intercity Express Lucknow Jong. He’ll departure at 16.05 pm. – 15044 Kāṭhagōdāma – Lucknow Jong. Express Lucknow Jung. Will reach 18.45 pm. – 12584 Anand Vihar Terminus – lucknow jong. Double Decker Express Lucknow Jong. 22.25 pm will reach. – 15043 Lucknow Jong.- Kāṭhagōdāma Express Lucknow Jong. He’ll departure at 23.25 pm. – 15011 Lucknow Jong.- Chandigarh express lucknow jong. He’ll departure at 23.55 pm. – 13019 Howrah-Kāṭhagōdāma Tiger Express Lucknow Jong. He’ll departure at 00.40 pm. – 15070 Kings-Gorakhpur Intercity Express will departure at 16.55 pm. – 15008 Lucknow Jong.- Varanasi City will departure from farmer express deoria sadar at 07.42 pm. – 11082 Gorakhpur – Lokmanya Tilak Terminus Express Courtney Jung. He’ll departure at 14.30 pm. – 55122 Maṇḍuvāḍ’̔īha-Courtney riding car will reach at 12.45 pm. – 55122 Maṇḍuvāḍ’̔īha-bhaṭanī ride will departure from car maṇḍuvāḍ’̔īha at 07.05 pm. – 15125 Maṇḍuvāḍ’̔īha-Patna express maṇḍuvāḍ’̔īha will departure at 06.20 pm. – 15008 Lucknow Jong.- Varanasi city farmer express mau Jong. He’ll departure at 10.02 pm. – 15008 Lucknow Jong.- Varanasi City Farmers Express Varanasi City will reach 12.35 pm. – 15017 Lokmanya Tilak Terminus-Gorakhpur express will departure from Varanasi at 13.10 pm. – 15160 Fort-chapra sarnath express will reach at 21.50 pm. – 55107 Siwan-thāvē riding car will departure from siwan at 06.15 pm. – 55075 Siwan-Gorakhpur riding car will departure from siwan at 03.40 pm. – 75012 Siwan-Gorakhpur Democrat car will departure from siwan at 10.30 pm. – 75010 Kaptānagan̄ja-thāvē demu car will departure from kaptānagan̄ja station at 14.40 pm. – 15044 Kāṭhagōdāma – Lucknow Jong. Express will be departure at 10.55 pm from the warehouse. – 25035 Delhi-Ramnagar Ramnagar will reach at 20.55 pm. – 55306 Ramnagar-moradabad riding car will departure from ramnagar to 07.00 pm. – 55308 Ramnagar-moradabad riding car will departure from ramnagar to 10.55 pm. – 55322 Ramnagar-moradabad riding car will departure from ramnagar to 21.05 pm. – 54157 Kanpur Central-pharrūkhābāda riding car will departure from kanpur anwarganj at 05.20 pm. – 15041 Pharrūkhābāda-Kasganj Express will be departure at 18.45 pm. – 15040 Kasganj-Pharrūkhābāda Express 08.45 pm departure from kasganj. – 15038 Kasganj-Kanpur will departure from central express kasganj at 12.00 pm. – 55307 Moradabad-ramnagar riding car will be arriving at 12.10 pm. – 15126 Patna-Maṇḍuvāḍ’̔īha express from patna to 17.45 pm reached maṇḍuvāḍ’̔īha at 22.15 pm. – 15705 Katihar-Delhi humsafar express from katihar, 05.40 pm to delhi on 11.40 pm. – 15706 Delhi-katihar humsafar express from Delhi to 13.45 pm on the second day of katihar reached 19.20 pm. – 12583/12584 Lucknow Jong 0-Anand Vihar Terminus – Lucknow Jong 0 Double Decker Express 03th July, 2018 is being run in a week. Each zone of Indian Railway published new train time table 2018 – 2019, will update North Frontier Railway’s train time table as soon as NFR published the details. North Western Railway announced the NWR train time table 2018. Following are the details. North Western Railway’s Bikaner Division Train Time Table are following. Train No.16189 Tambaram – Sengottai ANTYODAYA Daily Express via Main Line will leave Tambaram at 07.00 hrs to reach Sengottai at 22.30 and in the return direction, Train No.16190 will leave Sengottai at 06.00 hrs to reach Tambaram at 22.15 hrs. This will be a DAILY service with a composition of 16 General Second Class Coaches. Date of Introduction and Stoppages will be notified later. Train Nos. 15630/15629 Guwahati – Chennai Egmore – Guwahati Weekly Express extended to Tambaram. Train Nos. 15930/15929 Dibrugarh – Chennai Egmore – Dibrugarh Weekly Express extended to Tambaram. Train Nos. 76842/841 Cuddalore –Vriddhachalam –Cuddalore Passengers extended to Tiruppadirippuliyur. Train Nos. 76853/854 Nagore – Tiruchchirappalli – Nagore Passengers extended to Karaikkal. In Sengottai-Kollam Section, with effect from 09.07.2018 following trains were extended. Train Nos. 16791/16792 Palakkad Jn to Punalur Palaruvi Express extended to and from Tirunelveli. Train Nos. 56335/56336 Kollam-Edamann Passengers extended to and from Sengottai. Train Nos. 12625/26 Thiruvananthapuram – New Delhi – Thiruvananthapuram Kerala Exp. via Ernakulam Town instead of Ernakulam Jn. to ease congestion at Ernakulam Jn. and to improve punctuality of trains. Train Nos. 56386/56389 Kottayam-Ernakulam-Kottayam Passengers and Train.Nos. 56363/56362 Nilambur Road-Ernakulam-Nilambur Road Pasengers will be clubbed and run as a single train between Kottayam – Nilambur Road, duly renumbering it as 56363-56362 Nilambur Road – Kottayam – Nilambur road Passenger. The train is routed via Ernakulam Town by-passing Ernakulam Jn. to provide direct connectivity between Kottayam and Nilambur Road and to ease the congestion at Ernakulam Jn. Train No.17651 Chengalpattu – Kacheguda Express will leave Chengalpattu at 15.30 hrs instead of 15.35 hrs. South Zone Railway Time Table 2018 details are following. South Central Railway announced the Train Time Table 2018 details. Following are the details of Train Time Table and Railway Zones. *Please note there will be no change in timings in return direction of Train No. 17009 Bidar – Hyderabad Intercity Express. Following are the details of Nanded Division Train Time Table 2018. South Eastern Railway’s New Public Time Table will be effective from 15th August, 2018. The important changes are as following. Train Nos.18007/18008 Shalimar-Bhanjpur-Shalimar Simlipal Express will stop at Bagnan. Train Nos.38427 Howrah-Panskura EMU Local will stop at Abada. Train Nos.38433 Howrah-Panskura EMU Local will stop at Abada. Train Nos.38727 Howrah-Kharagpur EMU Local will stop at Duan. South East Central Railway’s train time table details are attached here, please click for the details of New Train Time Table 2018 – 2019 by SECR. South Western Railway has decided to augment with TWO AC 3-tier coaches for Train No. 12735, Secunderabad Jn. – Yesvantpur Garib Rath Express with effect from 27th April, 2018 and Train No. 12736, Yesvantpur – Secunderabad Jn. Garib Rath Express with effect from 28thApril, 2018. Train No. 12614, Bengaluru – Mysuru Tippu Express will leave Bengaluru at 15:15hrs (Earlier – 15:00 hrs) and arrive Mysuru at 17:45 hrs (Earlier – 17:30). Enroute the Train will arrive/depart at Kengeri at 15:34/15:35(Earlier – 15:19/15:20) hrs and Mandya at 16:33/16:35hrs (Earlier – 16:21/16:23).Train No. 16535 Mysuru – Solapur Golgumbaz Express will arrive /depart at Hotgi 11:58/12:00 hrs instead of 12:13/12:15 hrs. Train No. 16535 Mysuru – Solapur Golgumbaz Express will arrive /depart at Hotgi 11:58/12:00 hrs instead of 12:13/12:15 hrs. Train No. 16536 Solapur – Mysuru Golgumbaz Express will arrive/depart at Hotgi 14:30/14:32 hrs instead of 14:35/14:37 hrs. Train No. 57133 Bijapur – Raichur Passenger will arrive/depart at Hotgi 14:28/14:30 hrs instead of 14:30/14:32 hrs. Train No. 19301 Indore – Yesvantpur Express will arrive/depart at Akola Jn11:40/11:45 hrs instead of 11:45/11:50 hrs. Train No. 12650 Hazrat Nizamuddin – Yesvantpur Express will arrive/depart Balharshah at 01:30/01:35 hrs instead of 01:30/01:40 hrs. Train No. 12252 Korba – Yesvantpur Express will arrive/depart at Balharshah 19:00/ 19:10 hrs instead of 19:00/19:20 hrs. In the new Western Railway Main Line Time Table which comes in force from 15th August 2018, Western Railway has decided to run some new trains including Hamsafar and Mahamana Trains. Speed of some of the trains will be improved and route of some trains will be extended. 8 Passenger trains converted to MEMU. 13 pairs of trains extended. Frequency of 2 pairs of trains increased. Train Nos.79311/79312 Ratlam – Indore DEMU to run daily. 16507/16508 will originate/terminate at jodhpur instead of Bhagat Ki Kothi. 12547/12548 will originate/terminate at Agra Cann instead of Agra Fort w.e.f. 1/10/2018. Train No 19152 Gandhidham – Palanpur Express will depart Bhuj at 11.20 hrs and to reach Palanpur at 19.20 hrs. This train will halt at all stations between Bhuj and Gandhidham. Train No. 19151 Palanp. – Gandhiclham will depart from Palanpur at 3.30 hrs and reach Bhuj at 21.20 hrs. This train will halt at all stations between Bhuj and Gandhidham. Train No.59925 Palanpur – Gandhitlham depart from Palanpur 20. 00 hrs and reach Gandhidham at 03.05 hrs. Train No.59169 will depart from Anand at 08.40 hrs instead of 07.30 hrs to reach Vadtal at 09.40 hrs. Train No. 59170 will depart Vadtal at 15.15 hrs instead of 16.05 hrs to reach Anand at 16.15 hrs. Train No.52963 will depart from Dr Ambedkar Nagar at 09.15 hrs instead of 06.45 hrs to reach Sanawad at 11.45 hrs. Train No.52974 will depart from Sanawad at 09.15 hrs instead of 06.05 hrs to reach Dr. Ambedakar Nagar at 11.45 hrs. Train No.52976 will depart from Sanawad 17.45 hrs instead of 18.45 ht.s to reach DrArreedakar Nagar at 20.15 hrs. Timing of 158 trains of Vadodara divisions, 106 trains of Ahmedabad divisions, 39 trains of Ratlam division, 4 trains of Rajkot division and 23 trains of Bhavnagar division have also been pre-poned. Some trains have been postponed. Timings of total 190 trains that pass through Vadodara railway station will change with effect from August 15, 2018. According to the new time-table of trains that will come int effect from Wednesday, a total of 94 trains making up and down movements will be preponed. Another 96 trains making trains making upward and downward movements will be postponed. The timings of the trains have been changed by five to ten minutes compared to the present timings. At the same time, five passenger trains that originate from railway stations that fall in Vadodara railway division have been preponed while eight passenger trains that originate from these railway stations have been postponed. Each zone of Indian Railway published new train time table 2018 – 2019, will update West Central Railway’s train time table as soon as WCR published the details. Konkan Railway announced that as a precautionary measure, taking into account the heavy rainfall, geographical and soil conditions as well as vulnerable sections on the Konkan Railway Route, Monsoon Timetable was adopted on Konkan Railway from 10th June to 31st October 2018 for safety and security of its passengers. Intensive footplate inspections as well as track safety inspections were carried out from time to time during the monsoon for smooth train operations. Due to this the train operations during this monsoon season have functioned efficiently. With the offset of monsoon, Konkan Railway has now adopted the regular Time Table w.e.f. 1st November 2018. For more details please visit website www.konkanrailway.com. Railway also published Fare Chart for 2018 – 2019 along with the new train time table. 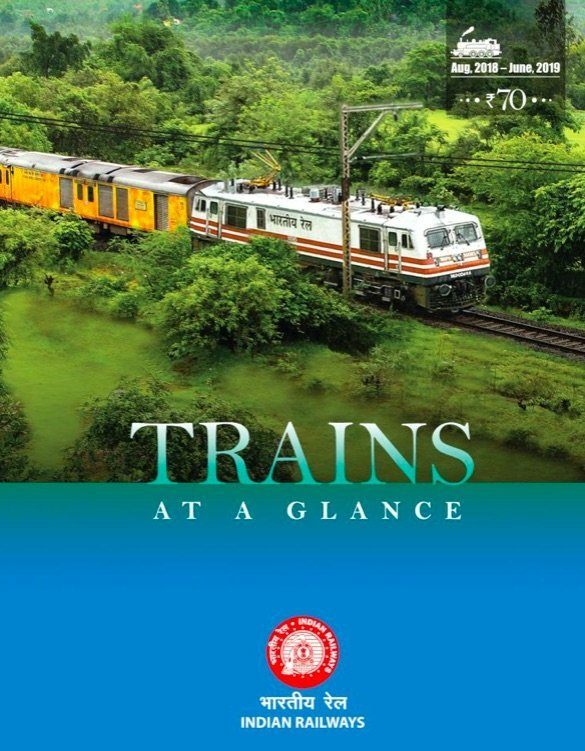 Page starts with “NEW TRAIN TIME TABLE 2017 – 2018 Details” but there is nothing else about the 2017-18 edition. Where is the time table 17-18? Southern Railway is increasing many trains for Kerala public whereas Tamil Nadu people are neglected. MPs of Tamil Nadu is not having adequate knowledge about trains so this happens. South Tamil Nadu public are totally neglected. Tirunelveli and Kanyakumari need more trains as they are traveling to Chennai and rest of the places by bus due to non availability of train accommodation. To travel rest of the country Tamil Nadu people travel either to Chennai or to Thiruvananthapuram to catch train. This is pathetic. Many trains terminating at Thiruvananthapuram must be extended upto Kanyakumari or to Nagercoil. In earlier Trains At A Galance timetables there used to be a page having the yearly calender. It is not there since last 2-3 years. Please include it once again. Also, as was done earlier, there should be at least two ruled blank pages meant for the passengers to joy down their travelling plans. Please start it again.